The bombing on February 22 of the Askariya shrine in Samarra, Iraq, was a tragedy, but it was not an American or a coalition tragedy. The destruction of the Golden Dome, built in 1905 and one of the holiest shrines of Shiite Islam, represents an escalation of the Sunni assault on the Shiites, a purposeful outrage intended to provoke an emotional backlash. It signals not Sunni weakness but the determination of elements in Iraq's long-ruling community to reassert its dominance. Iraq's president, Jalal Talabani, has rightly warned, "The fire of sedition, when it breaks out, can burn everything in its path and spare no one." One shudders at the possible carnage ahead. That said, Iraq's plight is neither a coalition responsibility nor a particular danger to the West. When Washington and its allies toppled the hideous regime of Saddam Hussein, which endangered the outside world by beginning two wars of expansion, by building a WMD arsenal, and by aspiring to control the trade in oil and gas, they bestowed a historic benefit on Iraqis, a population that had been wantonly oppressed by the Stalinist dictator. Unsurprisingly, his regime quickly fell to outside attack, proving to be the "cakewalk" that many analysts, including myself, had expected. That six-week victory remains a glory of American foreign policy and of the coalition forces. It also represents a personal achievement for President Bush, who made the key decisions. But the president decided that this mission was not enough. Dazzled by the examples of post-World War II Germany and Japan – whose transformations in retrospect increasingly appear to have been one-time achievements – he committed troops in the pursuit of creating a "free and democratic Iraq." This noble aim was inspired by the best of America's idealism. But nobility of purpose did not suffice for rehabilitating Iraq, as I predicted already in April 2003. Iraqis, a predominantly Muslim population newly liberated from their totalitarian dungeon, were disinclined to follow the American example; for their part, the American people lacked a deep interest in the welfare of Iraq. This combination of forces guarantees the coalition cannot impose its will on 26 million Iraqis. It also implies the need for a lowering of coalition goals. I cheer the goal of a "free and democratic Iraq," but the time has come to acknowledge that the coalition's achievement will be limited to destroying tyranny, not sponsoring its replacement. There is nothing ignoble about this limited achievement, which remains a landmark of international sanitation. It would be especially unfortunate if aiming too high spoils that attainment and thereby renders future interventions less likely. The benefits of eliminating Saddam's rule must not be forgotten in the distress of not creating a successful new Iraq. Fixing Iraq is neither the coalition's responsibility nor its burden. The damage done by Saddam will take many years to repair. Americans, Britons, and others cannot be tasked with resolving Sunni-Shiite differences, an abiding Iraqi problem that only Iraqis themselves can address. Invite Syrian and Iranian participation, hastening the possibility of an American confrontation with those two states, with which tensions are already high. Terminate the dream of Iraq serving as a model for other Middle Eastern countries, thus delaying the push toward elections. This will have the effect of keeping Islamists from being legitimated by the popular vote, as Hamas was just a month ago. Reduce coalition casualties in Iraq. As noted by the Philadelphia Inquirer, "Rather than killing American soldiers, the insurgents and foreign fighters are more focused on creating civil strife that could destabilize Iraq's political process and possibly lead to outright ethnic and religious war." Reduce Western casualties outside Iraq. A professor at the U.S. 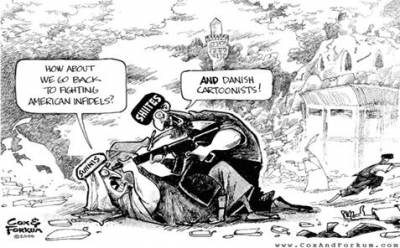 Naval Postgraduate School, Vali Nasr, notes: "Just when it looked as if Muslims across the region were putting aside their differences to unite in protest against the Danish cartoons, the attack showed that Islamic sectarianism remains the greatest challenge to peace." Put differently, when Sunni terrorists target Shiites and vice-versa, non-Muslims are less likely to be hurt. Civil war in Iraq, in short, would be a humanitarian tragedy but not a strategic one. "When Sunni terrorists target Shiites and vice-versa, non-Muslims are less likely to be hurt." Oct. 20, 2006 update: Diana West goes a step further than I do in "A Vote for Civil War." I vote for civil war [in Iraq]. It seems obvious when Shi'ite and Sunni jihadis — and their Islamic world sponsors — are busy slaughtering one another, they have much less time to plan their next attack on Americans, in the region or stateside. Dec. 15, 2006 update: Diana West takes an even stronger stance in "Let the Muslims fight it out," where she finds the "let-them-devour-each-other strategy" to be "peachy."